RICHMOND, B.C. 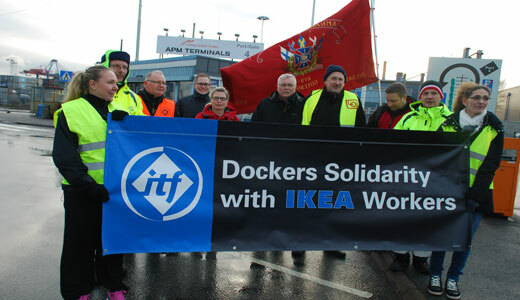 (PAI) – Port unions in 10 nations, including the International Longshore and Warehouse Union, demonstrated Dec. 17 against multinational furniture giant Ikea‘s lockout of 350 Teamsters workers from its Richmond, British Columbia, store since May 13. The protests, arranged by the London-based International Transport Workers Federation, occurred in Tokyo, Rotterdam, Holland, Vancouver, B.C., Gothenburg, Sweden, Helsinki, Finland, Kristiansand, Norway, Aarhus, Denmark, Felixstowe, Britain, Zeebrugge, Belgium, and Sydney, Australia. They follow a detailed report on the Swedish-founded, Dutch-owned firm’s mistreatment of the workers, issued last month by the ITF and UNI, another global union confederation. Representatives of the locked-out workers also told their stories that month to Swedish media on a trip there to challenge the $36 billion company. Ikea locked out the workers after they rejected company demand for a 2-tier wage system and an end to family health care benefits. “The report calls on Ikea to end its lockout and end its use of anti-union lawyers at the bargaining table,” the union said. “Attempts to circumvent the Richmond work force’s rights to association and collective bargaining mirror practices reported by Ikea workers about management in Turkey, Vietnam and Bangladesh,” the report adds. “Ikea must…break with the radical anti-union agenda in Canada and ensure its legal counsel follows the global standards of Ikea,” the report says. And Ikea should work with UNI on a “global framework agreement” for its worldwide labor relations, “confirming its commitment to social dialogue and the right to association and collective bargaining,” the report adds. “Long-serving workers” in Ikea’s Richmond store report that relations slid rapidly downhill starting with a 3-week 2007 strike management forced. Before, there was “a culture of social dialogue and respect between management and the unionized work force.” The workers beat back management’s demand for the 2-tier wage system. Since settlement of that strike, “relations have deteriorated” as managers avoid resolving even minor issues. The union has had to file 18 workplace grievances in the last three years, compared to seven grievances from 1995-2010. Turnover at the top hasn’t helped, as Ikea imported outside managers not familiar with either Ikea or the cooperative culture of the Richmond store. It also hired the anti-union law firm. “Access to the building by union representatives was restricted. There were new problems with membership applications, dues check-off, chronic mistakes in seniority lists and unresponsiveness to calls and emails from union representatives,” the report adds. And unionized workers at Richmond were isolated from contact with non-union Ikea workers at the firm’s other 11 Canadian stores.